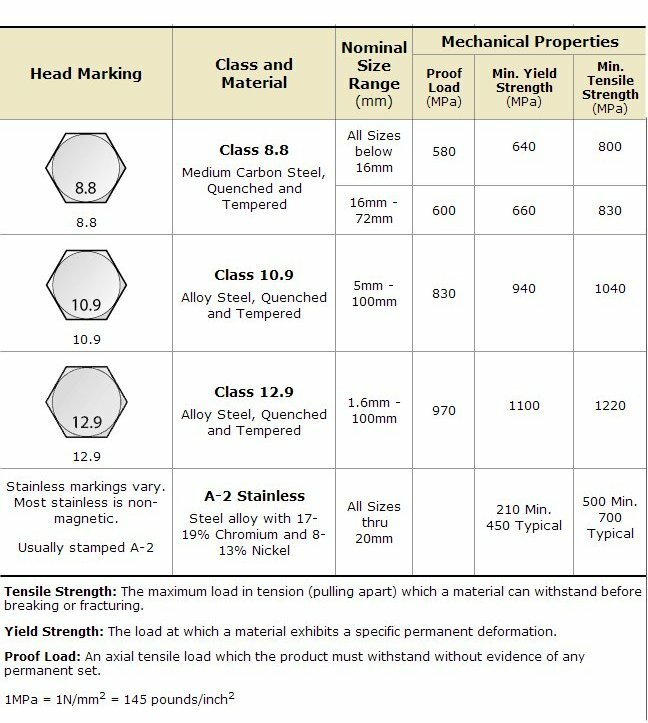 Except for the very lowest grades metric nuts and bolts all carry identification markings which indicate their strength. On the head of each bolt there are two numbers which are separated by a decimal point. The bolt heads also have a code of normally two or three letters that indicate the manufacturer. Usually the markings are found on top of a bolt head, but sometimes they can be on the side. The first number gives the breaking strength of the steel in the bolt, In round terms it is in the 10's of kgs per square millimetre of the bolt. For example, a grade 8.8 bolt will not snap until every square metre of the bolt cross section is carrying a load of atleast 80kg per square millimetre. A bolt will begin to stretch before it finally breaks, and the second number indicates how much breaking strength the bolt can stand befor it starts to stretch. For example, an 8.8 grade bolt will begin to stretch when the load of a bolt is 80% of its breaking load. A 12.9 grade bolt will being stretched at 90% of its breaking load. The rule is that the same grade of nut should always be the same as the grade of bolt, or a grade higher. 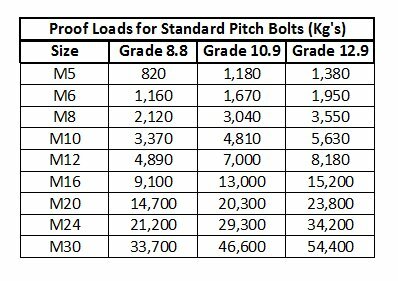 Proof loads are normally given in Newtons in manufacturers tables, but here they are converted into kg force. The proof load is usually considered to be the absolute maximum load that the bolt should be asked to carry.